Last-minute decision for Tzipi Livni not to run in a 'rotation' agreement breaks campaign promises before polls even open, MKs fire. 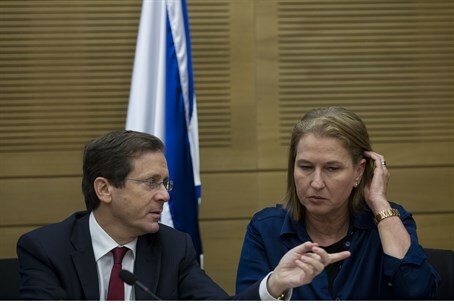 The announcement Monday that Tzipi Livni would not serve in a "rotation" agreement with Labor-Hatnua leader Yitzhak Herzog has drawn significant ire from MKs Monday night, who pointed out the poor timing of the announcement - the night before elections. "The historic announcement of Livni and Herzog marks new lows in terms of broken promises," MK Yariv Levin (Likud) stated Monday night. "If, until today, we had grown accustomed to the Left breaking its promises after elections, now these promises are being broken even before the polls open." "Whoever can't handle the stress of the night before elections is not able to handle the day-to-day stresses of premiership," he added. "Now it is absolutely clear that there is only one suitable candidate for Prime Minister - Binyamin Netanyahu - and that only one party fulfills its promises: Likud." "Livni's misstep is due to panic and a lack of trustworthiness," Deputy Environmental Protection Minister Ofir Akunis (Likud) said. "Voters aren't blind to tricks. In a moment of panic, it is already difficult for the Israeli public to follow the political twists of Buji [Yitzhak Herzog - ed.] and Livni as they struggle to close the gap between them and Likud." "What is clear here is that, for Labor-Hatnua, there is no path, there is no vision, there is no ability to actualize a better future for the citizens of Israel, and now, there is no trust," he added. Transportation Minister Yisrael Katz (Likud) agreed. "Buji Herzog failed in his first test of leadership and has proven to be untrustworthy," Katz argued. "After he crafted an entire campaign around the idea of a rotation, he retreats on that decision, and the central promises he made during the election campaign, on the night before elections due to pre-elections jitters." "We can only imagine what might happen if, G-d forbid, he becomes prime minister, and has to make decisions on Iran or on crucial political or economic decisions," Katz added. Some MKs attributed the timing to preparations - already - for a possible unity government. "The cat is out of the bag," MK Ayelet Shaked (Jewish Home) stated Monday. "Livni has given up the rotation agreement in order to authorize a unity government between Bibi [Netanyahu] and Buji." "In the tidal waves of bluffs that have been made known to the public, it is important to remember that only a vote for Jewish Home ensures a true right-wing government," she added. "This is a time of national emergency, and Herzog is not keeping his promises to keep Jerusalem united," Yachad Ha'am-Itanu leader Eli Yishai quipped. "We need a strong Yachad." "This step shows the extent of the deception by the Israeli Left, and as such it is clear that it is not beneath any trick or ploy in order to come to power," he elaborated. "The Zionist Union is under pressure, we are closing the gap and tomorrow, with G-d's help, we will win," Yachad candidate and former Jewish Home MK Yoni Chetboun said. "The nation isn't stupid - and it's clear to them that with or without a rotation, this is all a matter of semantics [. . .] Buji is Tzipi. It's impossible to detach one from the other, and it's a bond which leads the nation to loss." "Tomorrow, the nationalist camp will go out to save the nation from these two, these representatives of the New Israel Fund and anti-Israel organizations," he added. Leftist MKs, meanwhile, have welcomed the move. "I welcome news of the cancellation of the rotation agreement - it's a step in the right direction," Meretz chairman Zehava Gal-On stated Monday night. "However, it would be meaningless if Meretz disappears," she added. As of polls last week, Meretz stood at just four seats - barely passing the Knesset threshold. "There will not be a revolution, Netanyahu will be prime minister and Herzog will go to a national unity government."